Are you looking for an easy way to create sign up pages and stand-alone sales pages? There are a lot of options on the market, with LeadPages being one of the most popular options for entrepreneurs and coaches. I personally use and love LeadPages, but if you’re looking for options, check out the round-up below to find the best landing page creator for your business. LeadPages seems to be one of the most popular platforms for creating landing pages amongst entrepreneurs, and is the option I’ve used for my business over the past year. I love that there are lots of free templates to choose from, and that I can get a conversion-optimized landing page up in running in a matter of minutes. LeadPages also has a marketplace of affordable paid templates to choose from, should you need more options. I do wish the layouts were more flexible, but all-in-all it’s a great solution for me. I’m able to easily add Facebook ad tracking codes, I can host the pages on my site using the LeadPages plug-in, and I know that I’m using a layout that’s been tested and known to convert well, which is a nice perk! Unbounce’s mobile responsive landing page templates will help your landing pages look as great as they will perform. Unbounce was beautifully designed with flexibility in mind, so you can easily customize your landing page to suit your campaigns and brand. The drag and drop editor was designed for marketers. So you can get pages up and running without needing to know code, or calling in IT or professional designer support. A/B split testing is super simple to use if you like to test your layouts. I used Unbounce for many years at my full-time job and it was a wonderful option, but it can be a little pricey! I have noticed however that there is a (somewhat hidden) free version available! There will be an Unbounce branded footer at the bottom of the page, but you can still use all of the core Unbounce features with the free option. Instapage has a drag and drop editor, so you can build complex layouts without touching a single line of code and every page is 100% Mobile Responsive. You get one free page when you sign up, so you can test it out before commiting. If you enjoy the experience and want to move forward with them, upgrade to make even more amazing pages. Tracking and A/B testing tools are included, you can publish to WordPress, GoDaddy and more, and there are over 20 marketing tools (like MailChimp and CRMs) that you’re able to integrate with as well. If you’re new to landing pages, then FunnelKit is a user-friendly site to choose from. It’s designed for marketers, by marketers, to be easy to use, but also to focus on creating high-converting landing pages that will result in more leads and sales. The drag and drop editor is very flexible, allowing you to get the look you want. You can build squeeze pages, thank you pages, landing pages, sales pages, download pages, webinar registration pages and more… sky's the limit! OptimizePress creates high-converting sales pages, membership portals, and landing pages. Choose from any of the templates you’d like for your business for inside WordPress with the help of OptimizePress 2.0. If you're looking for one of the quickest ways to create opt-in pages, webinar pages, and much more, 1MinuteSites has everything that you will need. 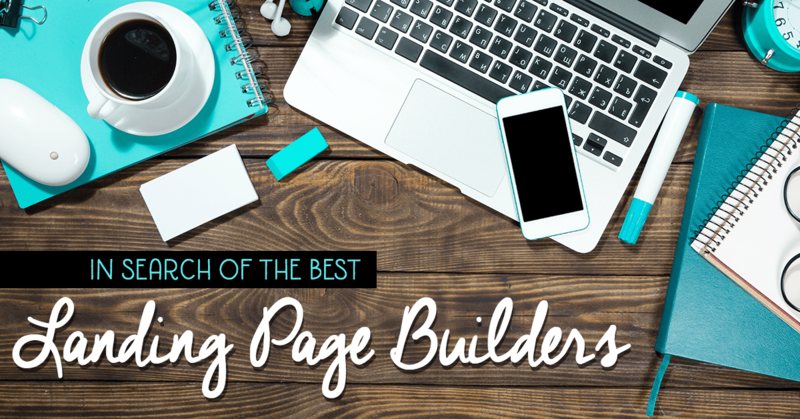 They claim that you can create your landing pages in 60 seconds or less, hence the name! Don't waste time trying to build something for hours, that could be done in no time. Do it quick, like a professional, and sway your potential clients with eye catching pages. Lander: $22/Month – $97/month or choose to pay annually. Lander’s landing page templates are designed for increased conversions. No matter your business or what campaign you want to run, Lander will have a template for your needs. After creating your page, use the testing tool to make sure everything is ready to go. Nice and easy! ClickFunnels is the only landing page site that doesn’t just build pages – it builds whole sales funnels! Not only can you create sales funnels, but also enjoy the ability to create webinar funnels, membership sites, as well as launch pages. Megaphone’s best feature has to be its simplicity. You can collect your leads, and connect with them in a jiffy. Choose the template that best matches your brand, and instantly add your own copy. It’s that easy! Megaphone also offers an email integration with some of the most popular providers used by entrepreneurs today. The WP Profit Builder plugin/theme is fully customizable, drag and drop, with nice templates to get you started. With several different types of pages you can create, this one-time purchase solution is a fantastic way to create the page you need, and make more sales. It came very highly recommended by several connections, so it’s definitely worth checking out, especially with the amazing one-time only fee instead of monthly payments like most services offer! Create great, eye-catching pages with Thrive Content Builder. With a simple click-to-edit ability, it makes creating pages easy. Create conversion-optimized, fully customizable landing pages, sales pages, lead-generation pages and more. There are some themes and other features available beyond just landing page builders as well. What are you using to create landing pages? Anything here you want to check out now? Great job Julie, I really appreciate your objective coverage of several options available for creating lead and sales pages. Thanks so much Shawn! And thanks for the link to your training! Thanks! I’m glad it helped, Lucy!